Read About How You Can Help Below! If you or your workplace or organisation would like to become a Partner of Country Hope, please feel free to get in contact with us to become involved in this great organisation. For further information about Country Hope, please contact your local representative or Head Office, details found at our contact page. To find out about how your organisation can become involved please visit contact page. Completing the online application form or contact us to request a hard copy (see requirements listed below). To apply to become a Country Hope Camp Buddy complete our online Camp Buddy Application Form here. Country Hope welcomes the kind support of volunteers from all over our large region who bring a large range of skills and knowledge to our organisation. Become a carer at our annual 'Time out for Life' children’s holiday camp. Although Country Hope organizes some fundraising functions throughout the year, we rely heavily upon community groups to provide most of our funds, thus allowing our energy and resources to be dedicated to serving the families and their children. Country Hope's many sponsors include service clubs, sporting clubs, social groups, work places and individuals who organise events and donate the proceeds or who simply make a donation. To Fund Raise for Country Hope all you need to do is simply complete the online Notice of Event - Authority to Fund Raise Application by clicking on the link or completing the application below. Once approved this will authorise you to raise funds for Country Hope. Click here to view our fund raising guidelines. Do you have fund raising, business, event management or marketing experience and would like to contribute to a worthwhile cause, or are you looking to build new skills and experience? 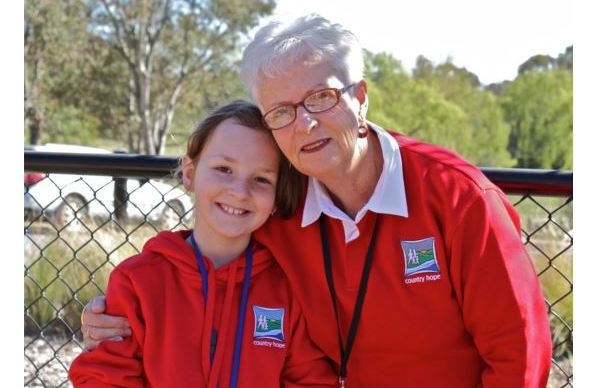 Country Hope welcomes and recognises the contributions of their volunteers. We provide training and ongoing support. To get involved please contact us. Have fun and join in! Become a member of our team!